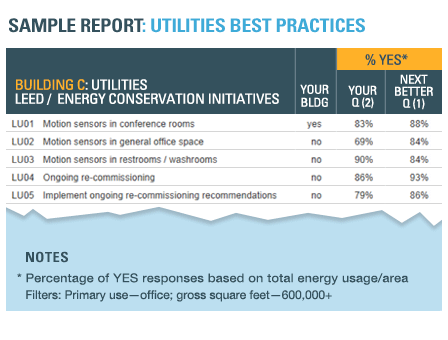 Three great tools let you COMPARE your building metrics to those for similar facilities, ANALYZE your results, and IMPROVE your performance. 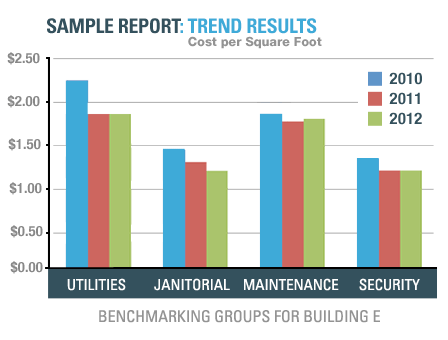 A full-featured benchmarking solution that enables you to analyze detailed building data and compare it to other similar buildings. For those who are new to benchmarking or who have limited time to collect data but still want the benefits of benchmarking. A fast, inexpensive way to get started benchmarking — simply “query” our database to see how your metrics compare to others. • No data to input! Sign up for our e-newsletter to receive news, updates, and benchmarking tips. Check out our online FM BENCHMARKING webinars! We offer a range of tools to suit the needs of facility and organization executives, professional facility managers, service providers, consultants, and associations. Each type of professional will achieve different benefits from benchmarking. 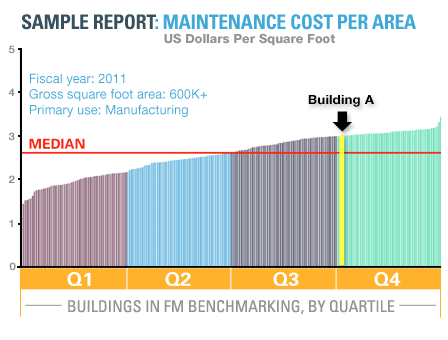 Learn more..
What types of FM costs can I benchmark? 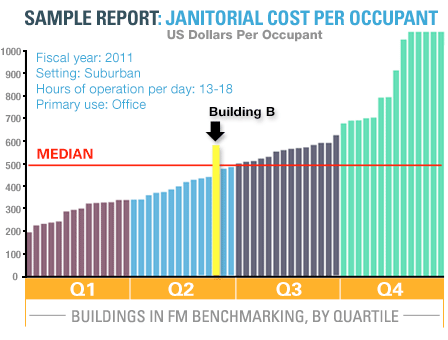 This chart shows how optimizing space utilization can impact total operating costs. 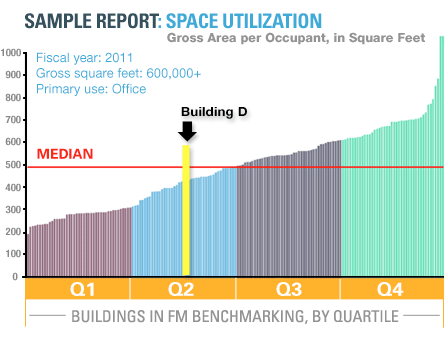 In Building D, which is has an area of 1.34M ft2, space utilization is about 435 gross square feet (GSF) per person. By consolidating occupants and eliminating the leased space, Building D could move to Q1 (at about 315 GSF/person), reducing its portfolio by 360,000 GSF. Assuming operating costs of about $7/ft2, this would save about $2.5M; in addition, eliminating the lease payments of about $15/ft2 would save about $5.4M, for a total savings of almost $8M annually.